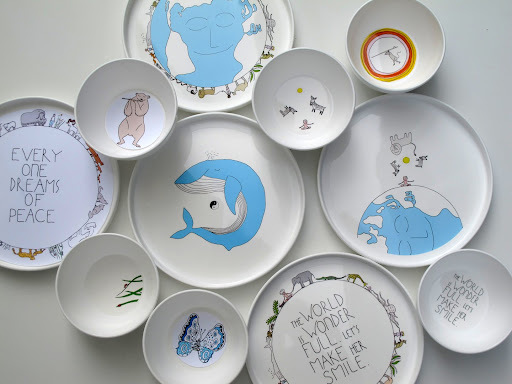 Smiling Planet's feeding gear is made in California and features adorable and unique illustrations that celebrate nature, the earth and wildlife, with the message that we "are all connected and we need to cherish each other." 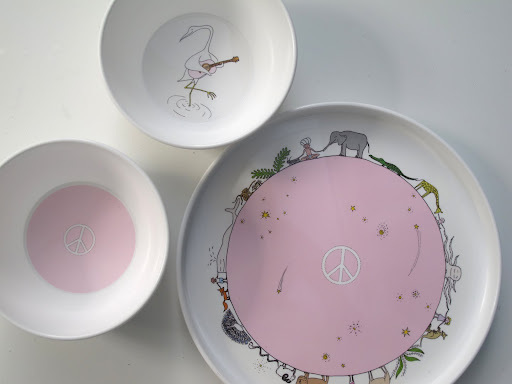 The husband and wife team behind the company produces their kid-friendly collection of plates and bowls to contain no BPA, no phthalates, no lead, and no toxic inks. Additionally, this dishware is lightweight, stackable, and unbreakable, and its surface designs are scratch resistant. The raised sides of the plate also handily keep food from sliding off, and the plates and bowls are dishwasher safe. Be sure to check out Smiling Planet's posters, which are printed on 100% recycled paper, and their t-shirts, which are 100% organic cotton, made in California and printed with water-based inks -- both feature the same adorable designs and creatures found on the feeding gear collection, so kids can enjoy the inspiring artwork on their plates and bowls even when they're not at the dinner table! 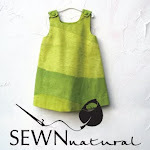 I just posted about smiling planet on my blog. I love them!